I went down to Richmond again last week to visit my good friend Christine – and because there are still a number of veggie burgers I did not try on my last visit, I took the opportunity to scratch one more off the list. Not to mention that being away for a three-day weekend provided the luxury of time to do such veggie-burger eating. I’ll be honest, my tv job is keeping me so busy that I don’t find myself with as much time for veggie burgers or blogging as I had in the past when I was more sporadically-employed. No regrets, since I love my job – but, just not enough hours in the day sometimes. 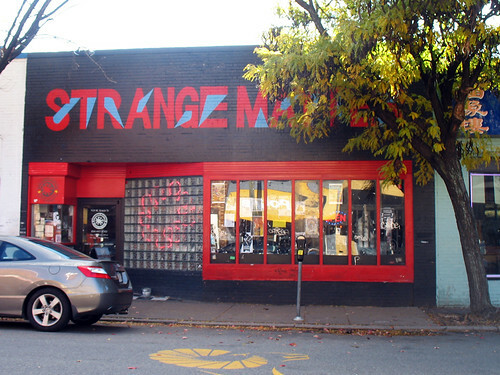 So I borrowed Christine’s bicycle and peddled over to Strange Matter – which is a cute alternative restaurant in the daytime and seems like it turns into a great live music venue at night. Definitely the kind of place I could see myself spending a lot of time in if I lived here. Richmond has quite a vibrant alternative and vegan side to it, which impressed me – and if I’m saying that after living in NYC for years, you know it must be true! 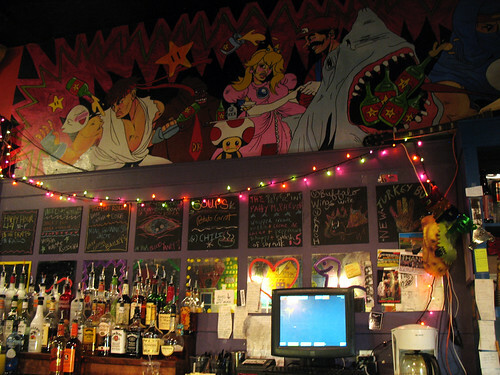 There are a ton of vegan options on Strange Matter’s menu – I wished I could try more of them. Vegan buffalo wings and vegan white Russians, among other things, caught my eye. I ordered a drink called a Laura Palmer (how could I resist?) and then got into a conversation with the bartender and her friend about Twin Peaks, and showed them photos of my Halloween costume. Because I'm a dork like that. The vegan lentil burger came with 1 side dish, and while there were a lot to choose from, I settled on the vegan macaroni. It was amazing, possibly the best vegan macaroni I’ve had at a restaurant (I make my own, which I think is pretty killer, so I’m often disappointed by restaurant versions). Thick and creamy, perfect comfort food. I would probably eat this at least once a week if I lived in Richmond. 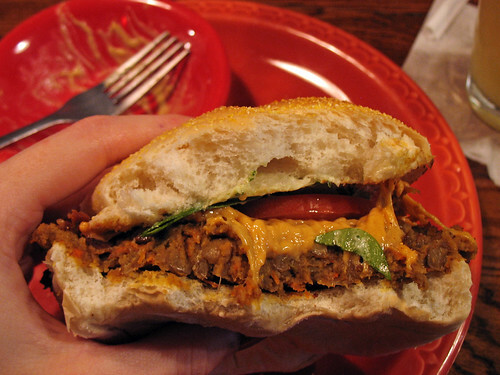 Luckily the portions weren’t insane, so I still had room for the main attraction – the veggie burger! It was just as delicious, a spicy patty of lentils and carrots – rather mushy, but it still stayed on the bun surprisingly well. I splurged and added vegan cheese (50 cents extra) to my burger, which was the perfect combination with the fresh spinach and tomato that it came with. The orange cilantro veganaise sauce was lighter than I was expecting, but still added a nice hint of flavor to the burger. The bun was the only part that hit the “just average” mark – I’m biased towards more hearty, granier buns. 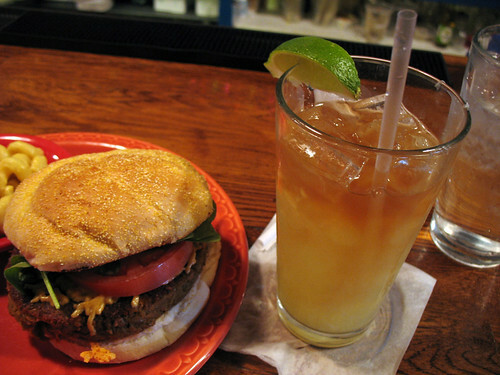 I saw a notice on the menu that all the burgers are half price on Tuesday evenings, too. So if you are in Richmond, I’d recommend checking this place out! 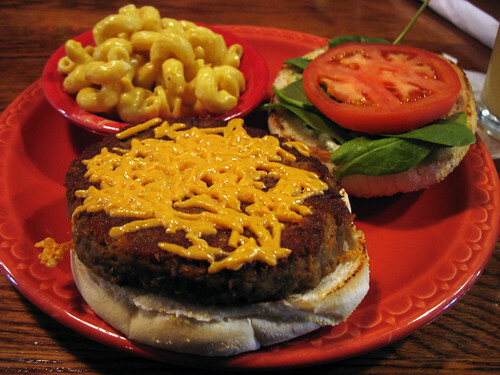 Only your blog could make me want a veggie burger with a side of mac at ten a.m.
That burger looks perfect! I love the money shot with the bite taken out and the vegan cheese oozing out. Best! Thanks Victoria! I wish I could hit the road myself and go try more burgers in different states, that's my fantasy road-trip. haha. One day...!